Here we see inlay patterns on paper, pre-cut inlay, and slab cut abalone blanks. Inlay work deserves more space than I have devoted to it here, but I’ll go over it a bit. Mac often cuts his own inlay by hand. Unique one of a kind design work can be achieved in this way. If you choose to cut your own inlay use a dust mask. Dust from mother of pearl and abalone are toxic! It is a slow process to cut one’s own inlay, but fun! Pre-cut inlay materials are available from various sources as well. The most common materials for inlay work are mother of pearl and abalone. Many other materials such as, bone, wood, or metal may be inlaid also. Installing pre-cut inlay is pretty easy. In the case of little round circles it is as easy as drilling a shallow hole that the dots can sit in. In the case of diamonds or some other shape, the router will likely be necessary. However, if you are very good with a chisel you may have no need of a router. First work out your designs on paper. Make photo copies of your designs before you cut them out and save them for future reference. Cut out your paper designs and have a look at them on the banjo. Look good? 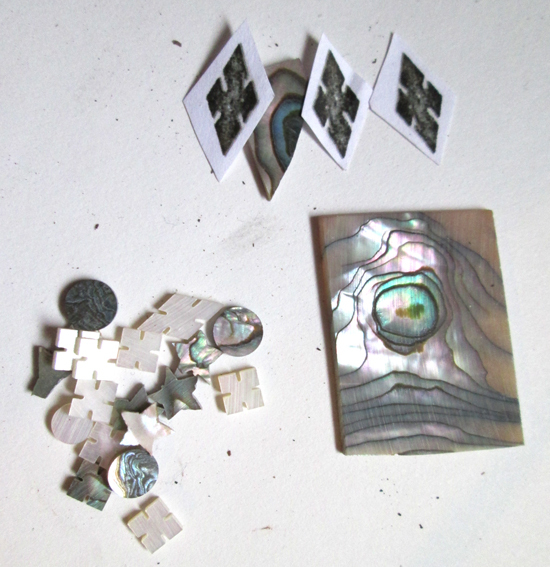 I use spray adhesive to fix the paper designs to the mother of pearl or abalone blanks. A jeweler’s saw is the tool of choice for cutting mother of pearl and abalone. Cut the shapes out as near as possible. Don’t be discouraged if some break, just try again. Use a needle file to knock off any rough places left by the saw. I use a Dremel tool with a very small bit and a precision router base to make the holes for the inlay pieces. Lay out the cut and filed inlays on the fingerboard. Use something sticky to hold them in place. Carefully trace around them with a scribing tool or sharp knife. Then, remove the inlay pieces and dust the surface to be inlaid with white chalk or shop dust to make the outlines stand out. Check the depth of cut on the Dremel against the thickness of the inlay pieces. Do a test piece first. It is okay for the pearl to sit a little proud of the piece being inlaid, but only a little. If you’re satisfied that the depth is right, go for it. Be very careful and run the Dremel at full speed. If some of the holes come out a little big that is okay, they can be filled. After all the holes are cut, use some epoxy or glue to anchor the inlay in place. Collect some dust from whatever kind of wood you are inlaying into. The finer the dust the better. Mix the dust with some clear epoxy, not too thick, but be sure to get plenty of color in it. Use this mixture to fill in any gaps between the edges of the holes and the pearl that was just glued into the work piece. After all the filler is in and set, level the face of the work piece. I use a long, trued by the jointer, piece of hardwood scrap with some 220 sand paper glued on it for the job of leveling. Once the leveling is done you may notice some voids left by air bubbles. Fill those in with more epoxy/dust and level again. After all of the air bubbles are filled, sand level with 220 and then progress to finer and finer grades of sandpaper. Continue up to 600 grit and then follow with fine steel wool. It can be nice to mark the frets on the side of the neck as well as on its face. Very small mother of pearl dots may be used or plastic may be used. For either one, drill a small hole the size of the dot and then fill if necessary.